The integrated ESWL machine enables the localization of urinary stones by x-ray or ultrasound, and the eventual fragmentation of the stones by shock or pressure waves. Extracorporeal shock wave lithotripsy (ESWL), as the term indicates, are pressure waves that are generated outside the body, which are passed into the body to break stones into small fragments. These fragments may even be as small as grains of sand. Once the stones are broken up into such small fragments, they pass out of the body through the urine stream over a period of time. 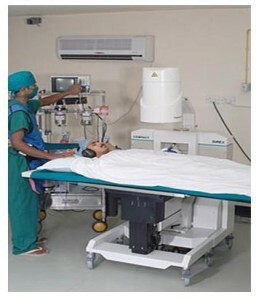 At NU Hospitals, we have the Direx-Tripter Compact Machine. This machine meets a wide range of requirements for the diagnostic and therapeutic treatments of kidney and ureteral stones. It utilizes a new and revolutionary shock wave generator, the Tri-lien, which is actually three generators in one. The Direx-Tripter Compact Machine is a fluoroscopic-based electrohydraulic lithotripter. Stone localization and patient positioning are performed with the aid of a computerized system. The patient is first evaluated for the site, size, location, and number of urinary stones. Other tests will also evaluate the function of the kidneys to find out whether the kidneys will be able to push out the fragments, once the stone has been powdered. Tests are also performed to evaluate other associated medical diseases, if any, which may come in the way of utilizing this treatment. The proof of successful completion of the treatment is obtained by performing an ultrasound evaluation and x-rays, in order to confirm the passage of the stones. Renal Stones: the Renal stone disease is an ancient and common affliction of man. Over a 70-year life-span, it is estimated that about 15% of people will develop renal stones. Although very few individuals die as a direct result of stone disease, it does lead to significant suffering from pain, urinary tract infections, and obstructive damage to the kidneys. Though newer and more effective methods of stone treatment are available, the actual cause of stone formation frequently remains unknown. So recurrence is bound to occur. Bladder Stones are stones that occur in the urinary bladder. After undergoing the required tests for this procedure, the patient is then placed on a table. A water balloon, inside which the shock waves are generated, is placed in contact with the body on the side of the stone to be treated. Using x-ray imaging, the stone is localized and focused upon. Pressure waves are then generated and focused onto the stones – approximately one every second. These pressure waves will fragment the stone. The duration taken for this again depends upon the size and the number of stones to be treated. Generally, the duration is limited to 45-50 minutes. If the stone has not cleared, repeat treatments will be administered. The main advantage of ESWL is that open surgery is not required. Apart from minimal discomfort, there is no severe pain and therefore the requirement of anesthesia is also very minimal. There is also no hospitalization involved most of the time. As a result, the patient can get back to work the next day. Some patients, however, may need endoscopy and stenting of the ureter to prevent persistent pain. This may require hospitalization for a day. At other times, a large load of stone powder may get blocked in the urinary tract, again requiring endoscopic intervention. A small percentage (5%) of stones do not get broken by this method and may need other modes of stone removal. All stones definitely cannot be cleared with ESWL. Success rate with stones in the kidneys is much higher than stones lower down in the urinary tract. Smaller stones have a better success rate than larger stones (stones that are larger than 2 cm). Pregnant women, patients with urinary tract infection, uncontrolled diabetes or hypertension, and bleeding disorders, are not candidates for this form of treatment. Similarly, those patients whose kidneys are not functioning will also not benefit from ESWL. For further details, please contact your urologist. Statistics indicate that 50% of all patients with urinary stones are likely to form a stone again. For this reason, certain dietary changes are prescribed for all patients with this condition. This mainly involves cutting down on non-vegetarian food and highly carbonated drinks increased dietary fiber and increased fluid/water intake. For this too, your urologist will provide you with the necessary details depending upon the nature of the stone and associated medical conditions. If the stones for this treatment are appropriately chosen, this treatment need not cost any more than other types of treatment.